PowerPaint is a paint program a little bit similar to Microsoft Paint, but not. It allows you to modify existing photos or to create new drawings and then save them as either JPG, BMP, TIF, GIF or PNG. The program itself actually advertises itself as a suitable replacement for Windows Paint and it certainly does include a nicer layout and many more features than the standard program which comes for free with Windows. Unlike Windows Paint, though, you're able to apply some image toning and color effects such as gray, black and white, hue shift, gamma, brightness/contract and saturation. 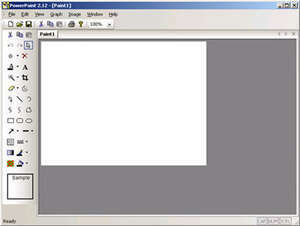 PowerPaint 2.50 is a shareware program and can be used as a demo to try the software until the free trial period has ended. A full version of the program is available after the trial period ends. For security reasons, you should also check out the PowerPaint download at LO4D.com which includes virus and malware tests. Additional screenshots of this application download may be available, too.